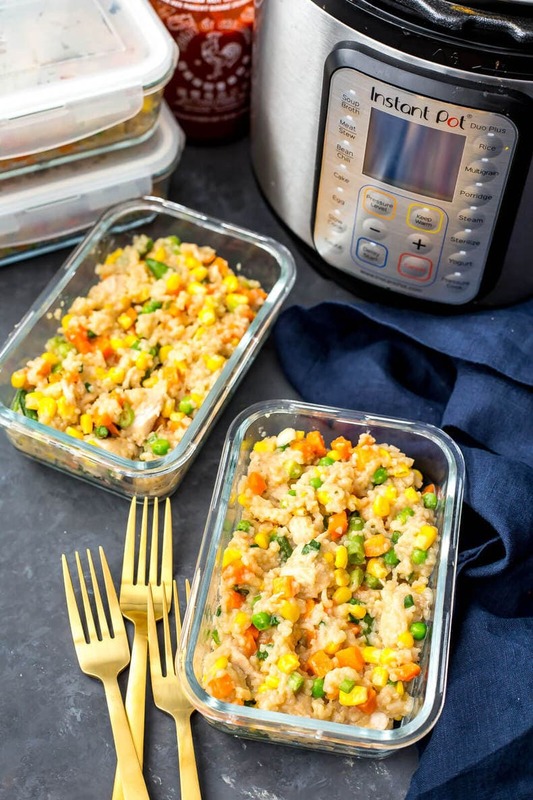 These Instant Pot Chicken Fried Rice Meal Prep Bowls are a delicious one pot option for work week lunches – all you need is rice, chicken and frozen veggies for rice that tastes like Chinese takeout! Hello healthy takeout for lunch cooked all in one pot! I haven't done this since these One Pot Chicken Teriyaki Bowls! And I wanna try a variation of this with Bibimbap too! 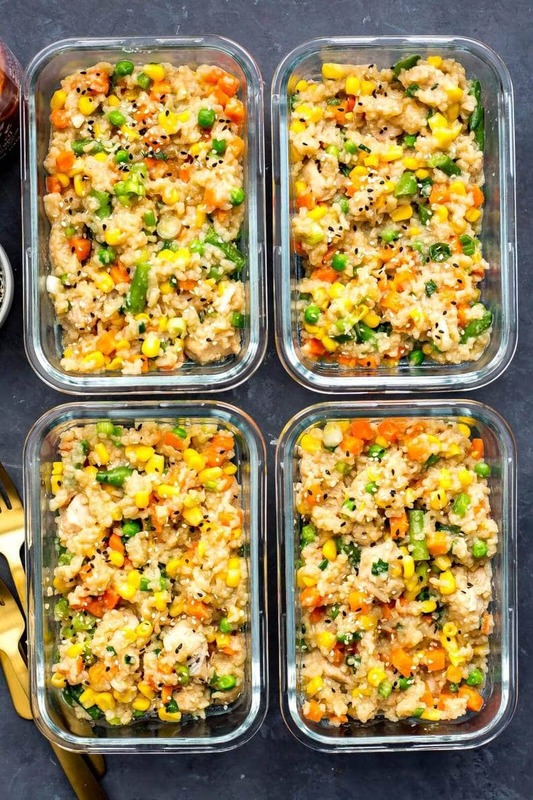 These Instant Pot Chicken Fried Rice Meal Prep Bowls are seriously the most delicious stir fry bowls without the stir fry! I honestly can't even rant enough about my Instant Pot in terms of how helpful it's been with meal prep. You literally dump everything in, cook 15 minutes (by the time it all comes to pressure) and then divide it all up. Easy peasy, just what I need in my crazy-busy life. OMG speaking of crazy-busy, I'm really trying to cut back on how much I rush around. I find I just get in these modes of working where I'm going non-stop, and then whenever I need to run a personal errand or need to take care of something in my personal life I always feel so go-go-go, rush-rush-rush and like I never have time for anything. Lately it's been getting me to think about how hectic our lives are and I'm wondering how much of it we can even control. Even though I work for myself and mostly work from home, I feel this ever-lasting pressure to never take any time off, and I often find myself slipping away from my personal life and feeling as though I can never shut off or turn down. Burnout never really happens in my family because we are all workaholics, and don't get me wrong, I enjoy my work and I actually like working, it gives me a sense of purpose. But, I don't want to feel as though I'm working myself into the ground and living my life working just to work. Of course I consider this one of the reasons I even have a meal prep blog in the first place, it's meant to help others navigate their own crazy busy lives and cut down on cooking while saving money. 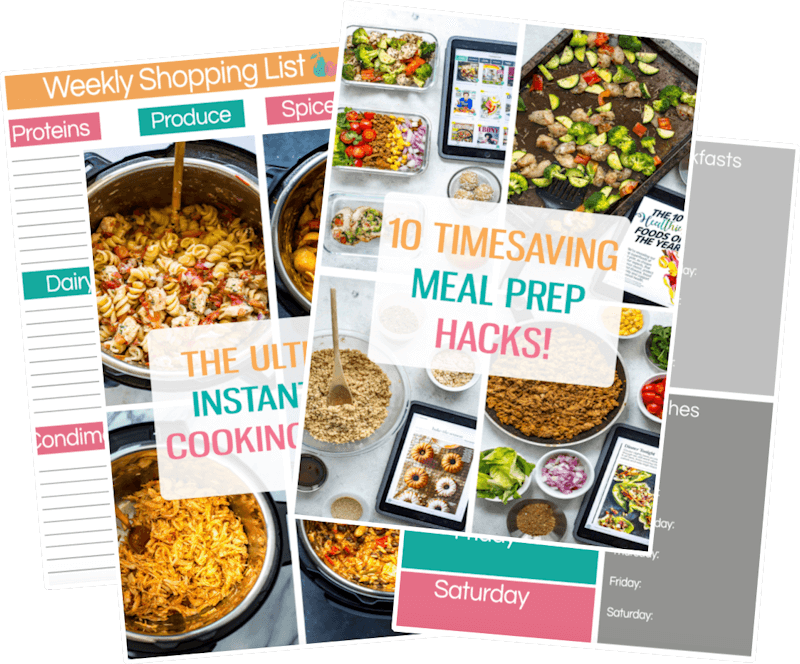 One of the ways I'm able to stay sane and get everything done for sure is thanks to meal planning and keeping organized, and I love to help others do the same. As I've said time and again, one of the ways I feel like I can get my time back and have more time to relax and enjoy the limited time off that I do have is by meal prepping, and let me just tell you how much I looooooove these Instant Pot Chicken Fried Rice Meal Prep Bowls. And they are so versatile too! 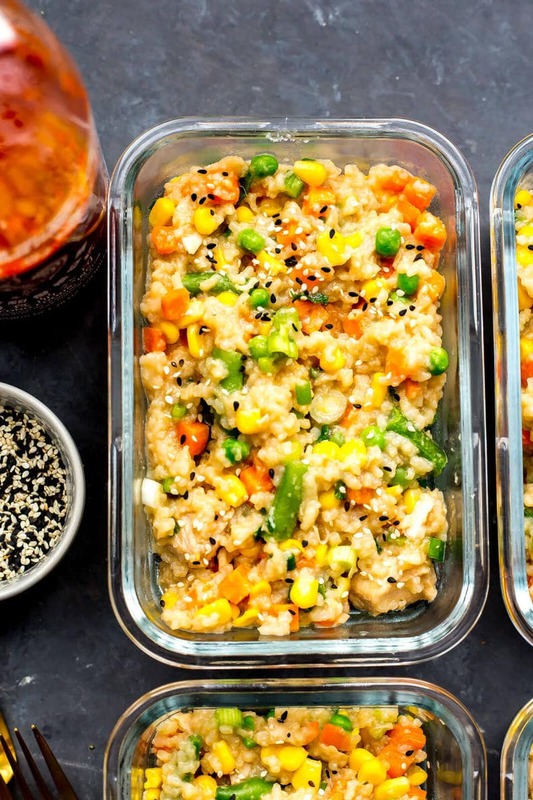 I added in frozen veggies because I constantly have WAY TOO MANY of these bags kicking around the freezer and I thought this rice was the perfect opportunity to free up some room in the freezer and get my veggies in easily. Add in some chopped spinach at the end of cooking time and you've got an additional nutritional kick! 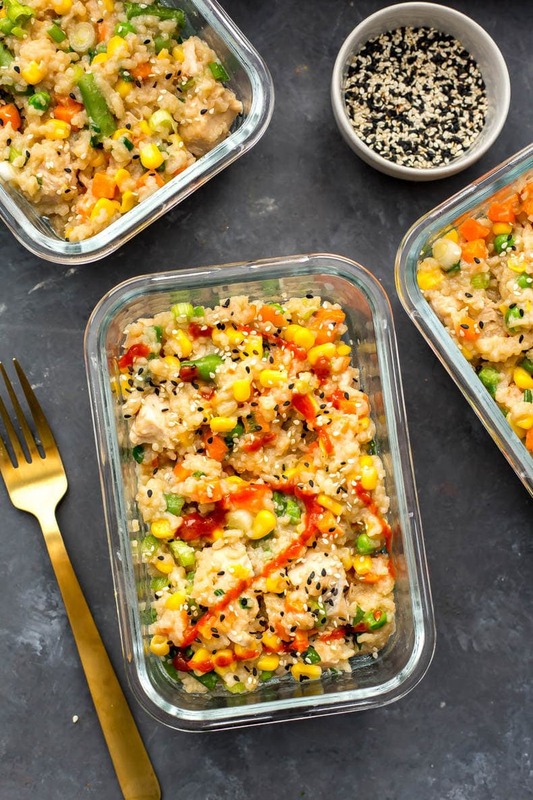 I kinda wanna think of some different ways to switch up the fried rice game because I imagine there are so many add-ins you could throw in to the base of these Instant Pot Chicken Fried Rice Meal Prep Bowls. Really, you just cook the rice and chicken with soy sauce and chicken broth (add a bit of garlic for good luck!) and then you can throw in whatever veggies, sauces, etc from there. Honestly the combos are endless! And you could also switch them up for the different days of the week so you're always enjoying a different variation! 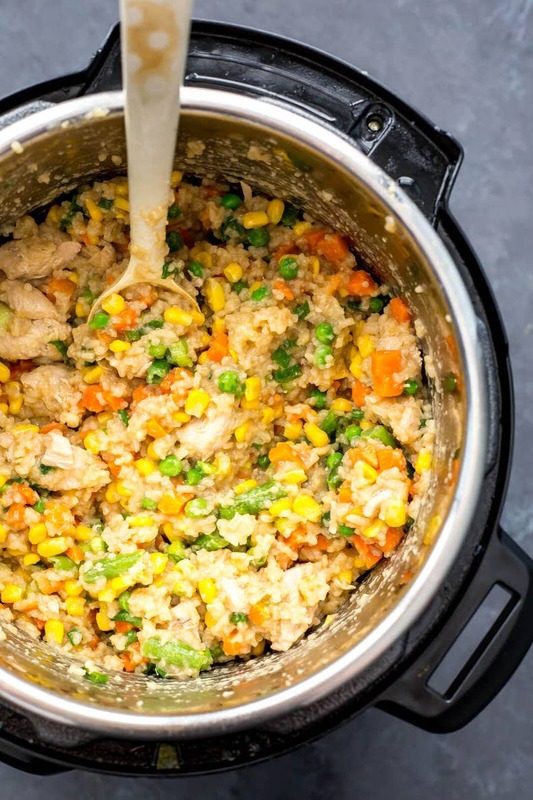 Will you be making these Instant Pot Chicken Fried Rice Meal Prep Bowls? 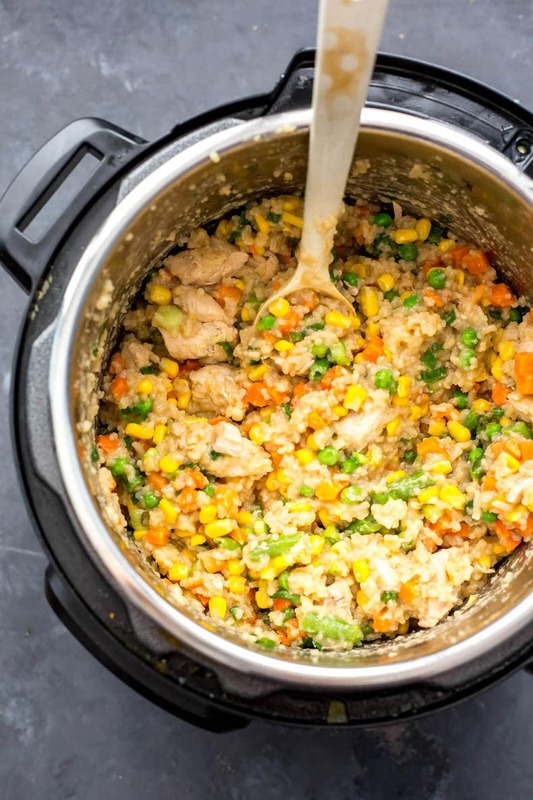 All you need is 30 minutes, some frozen veggies, chicken and rice along with your Instant Pot to put together the best lunch ever! Now all I need to do is start coming up with some more fun fried rice variations…I could eat this everyday! 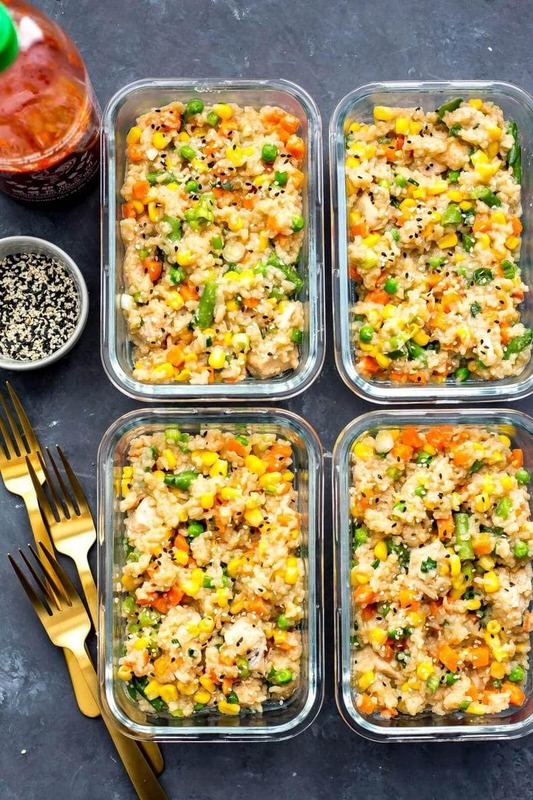 These Instant Pot Chicken Fried Rice Meal Prep Bowls are a delicious one pot option for work week lunches - all you need is rice, chicken and frozen veggies for rice that tastes like Chinese takeout! Add butter, garlic, chicken, chicken broth, soy sauce and rice to Instant Pot in that order. Cook on high pressure for 3 minutes. Do a quick release of the pressure and open lid when it is safe to do so. Meanwhile, microwave frozen vegetables in a large bowl for 5 minutes until de-frosted. Add veggies and green onions to rice in Instant Pot, stirring well to combine. Serve and enjoy - will last in the fridge up to 5 days. If you double it, would it change the cooking time? Hi Theresa – I honestly couldn’t say because I haven’t tested it myself. I would say maybe increase the cooking time by a minute or two on your manual pressure setting and see if that works! We did double it and we had to double the time. So we put it in for 6mins. Thanks for the heads up Kelly! Hope you liked it! These look really good. Just wondering where you get the set of glass containers. I have only found the sets with small, med & large…Would love to have a set of the larger ones like these for meals! This looks terrific. Does the rice really cook in 3 minutes? I make another fried rice recipe that cooks perfect in 10 minutes rice mode. Quick release. Hey Tracie, thanks so much 🙂 It may be because that’s rice mode, this is high pressure mode! The rice is definitely done after that time – I find it’s more the ratio of liquid you want to be careful with and I’ve tested this with jasmine rice, it works! Thank you. Yes, it cooks perfectly in the 3 minutes 🙂 I chopped up a couple carrots and half an onion and added to the pot to cook instead of the frozen (because its what I had). Very quick and easy recipe. Hey Will – so sorry to hear this didn’t turn out for you! 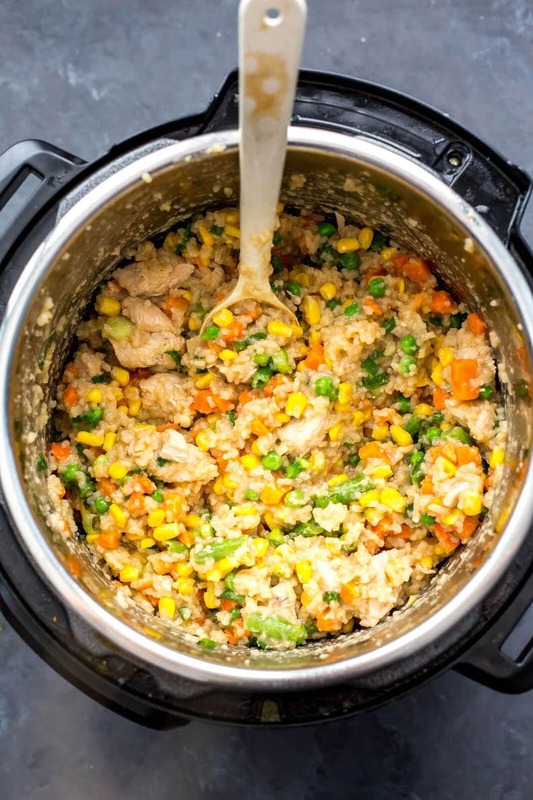 I can assure you that you can make a ton of different grains in the Instant Pot. Did you use jasmine rice? I’ve heard other types of rice take longer to cook which could have resulted in this not being cooked through for you. 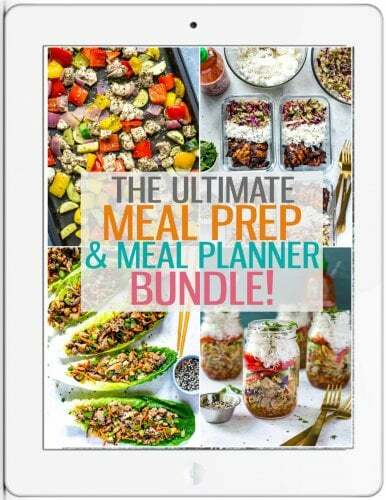 I’ve tried this recipe a few times now and the method listed works for me! Mine came out as a stew as well! And I used Jasmine rice.. not sure what happened. But it looks like a delicious recipe! Hmm so strange…I’m wondering if certain types of jasmine rice vary? That is honestly the only thing I think could be happening here! So sorry about this Vanessa! Loved this! I heated up the frozen veggies on the stovetop with the leftover broth. I also sauteed the green onions on the stove in a little bit of olive oil and then added 2 scrambled eggs to cook with it. (I might try 3 eggs next time.) There was some liquid left in the instant pot after opening the lid, but I turned it to saute mode to cook off some of the extra liquid while I added in the veggies and the scrambled eggs/green onions. Will definitely be making this again! Yeah I got the same thing as Will, fried rice soup. Followed what you said exactly, put all the ingredients in besides veggies and green onions and pressure cooked on high for 3 min with a quick release. Just seems like too much liquid. Isn’t the rule of thumb 1 cup of liquid for 1 cup of rice generally? Hi Andrew – did you use jasmine rice as the recipe says? I know white rice and brown rice both take much longer to cook and absorb liquid so that is probably the issue here. From my understanding it’s 1.5-1.75 cups of liquid per 1 cup of rice (jasmine rice anyway – see here for more info: https://rouxbe.com/tips-techniques/379-cooking-rice-general-liquid-to-rice-ratios) but you need an extra little bit of liquid to account for the chicken. Hope that helps! After hearing stories of the results being “soupy”. I increased the amount of jasmine rice to 1.5 cups. The rice came out great. Not soupy and the rice was full cooked, I like how this recipe calls for the veggies (carrot, peas and green onion) to be prepared separately, as my son does not like veggies in his fried rice. He loved it! So happy to hear you liked it Chad!!! 🙂 Thanks for sharing with me! Low sodium soy sauce would be a great idea! Hey so I tried this today and put it on for 6 minutes instead of 3 because of the comments, and decided to use no butter to avoid the fat. Also just put the veggies in the instant pot with the rest. It turned out great. I’ll make this often. Thanks!